The Pasadena Symphony is a brilliant experience rivaling the best in Los Angeles with its unique style and stunning artistry. Music Director David Lockington led the orchestra and guest pianist Zhang Zuo (“Zee Zee”) through a top-notch performance of Saint-Saëns’ Piano Concerto No. 2 on Nov. 20, as an installment of the Singpoli Classics Series, this concert sponsored by Marlene R. Konner and John D. Baldeschwieler, at the Ambassador Auditorium in Pasadena. Zhang Zuo is an imaginative and captivating pianist. Her enthusiasm overtly infused the music, and she seemed one with the instrument as her posture and gestures informed each phrase. The audience was fully engaged from her first few touches. Her fresh, natural expression was at moments passionate, and the skill and sensitivity were stunning on the feather-light arpeggios flowing like mist from top to bottom of the keyboard — it was fascinating to watch and hear such mastery. 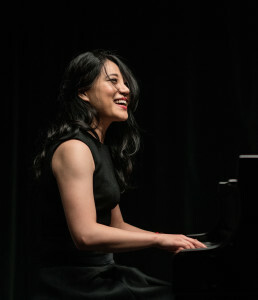 Zee Zee treated her solo in the dramatic fashion that Saint-Saëns intended, but while keeping attuned to the orchestra, there were spectacular feats of pianistic prowess impressively belied by her exquisite technique. The solemn Andante sostenuto opening solo was forceful like a fanciful Bach toccata. The sheer exuberance of her keyboard athleticism was precisely in character, and I do not recall having heard such an impressive display of talent and skill. The end of the first movement evoked an energetic pause in the interim, full, I am sure, of enthusiastic silent applause. Zee Zee was brisk in the scherzo, and the concluding Presto became a virtuoso showpiece with its blinding speed coupled with a touch so gentle and light that the texture was airy at times, yet all the while maintaining an appealing dynamism. Should you have an opportunity to hear Zhang Zuo in the future, do not pass it up. The program opened with Rossini’s Overture to The Barber of Seville, a piece that endures as one of the more recognizable operatic overtures in popular culture. The association with Bugs Bunny and Woody Woodpecker is inevitable, and no mortal can resist the energetic ostinato and drama of a delightfully tuneful opera buffa. The slow Andante maestoso was drenched in drama as it alternated between the forte tutti orchestra and contrasting smaller groupings. Lockington changed tempos ever so subtly as the musical dialogue progressed. My anticipation was whetted when the famous theme would not be suppressed, and the iconic Rossini sound we so fondly recall just swept us away — a nice opening. Rossini was a great pairing with Mozart, and sincerely, thanks for the memories. Post intermission, Mozart’s Symphony No. 41 filled the hall with all the energy that the orchestra could muster — which was amazing. The winds were spectacular in their individual solos, and in section they blended extraordinarily well. Lockington was graceful with the lyric themes, and he produced a uniquely sculptured sound with the orchestra. He was masterful at juggling all five themes at once and joyfully weaving them into a finale that was tremendous. Pasadena’s “Carnegie Hall of the West,” the Ambassador Auditorium, has very good acoustics, slightly dry from my seats, but the music was very crisp. Every nuance was audible, especially from the piano, further enhancing the experience of Zhang Zuo’s extraordinary performance. Bravo! Zee Zee is tops! Bravo Ted! I must hear this Zee Zee. Youtube perhaps?